It is snowing like crazy outside right now and I am so excited! We ventured out for lunch today because it didn't look like anything was going to happen...then BAM! Suddenly the roads were already covered by inches of snow! We barely made it home (we live in the country, where the roads never get plowed). My husband even had to walk home after his truck got stuck. Snow around here is just so exciting. 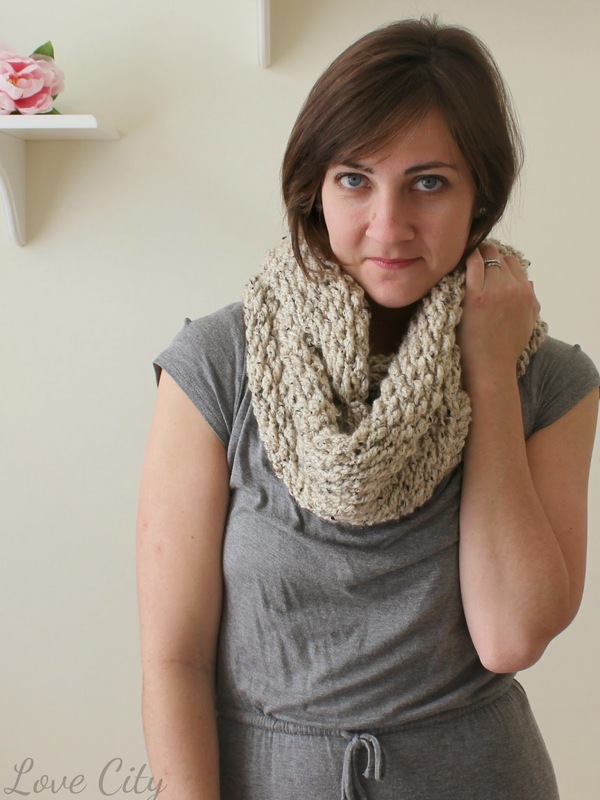 It's the perfect excuse to warm up with some yarn in your lap and a crochet hook or two. 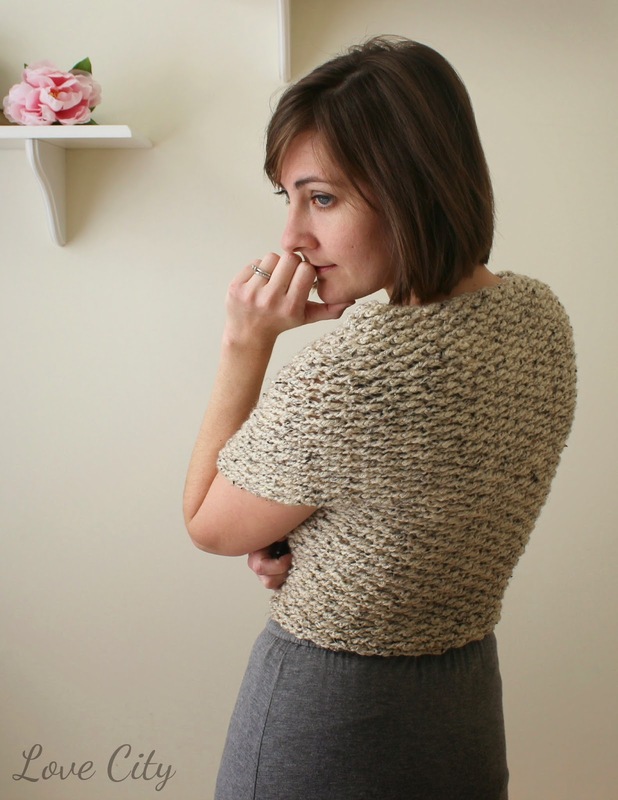 This wrap sweater was inspired by Wool and the Gang's Cross My Heart Wrap. I love all of their designs, and could browse their site for ever. I saw this wrap and thought it was so cute, but something simple enough that I could make my self! Their version is knit, but I decided to crochet mine in a textured stitch that almost looks knit. Well, the idea is so simple. 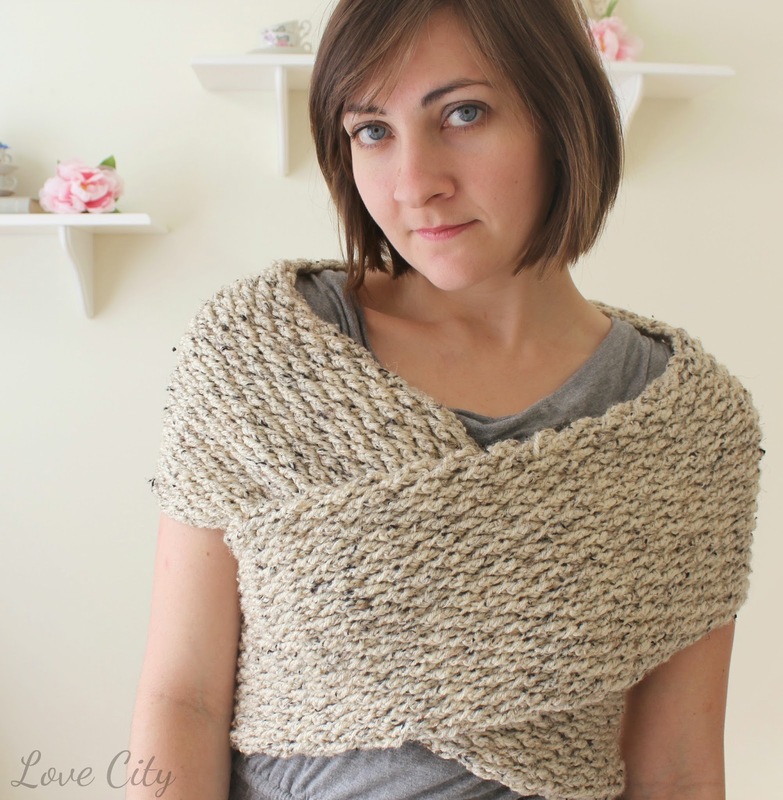 You basically crochet one long, long piece, sew the ends together, and wrap around yourself! With 4 skeins Vanna's Choice yarn (worsted weight) and size I crochet hook. 1. Ch 35. Tr into 4th ch from hook. Dc in next ch. *Tr in next ch. Dc in next ch. Continue from * until the end of the row. Should end with dc in last ch (33 sts total including 3 ch from beginning). Turn. 2. Ch 2. *1 bpdc around tr from previous row. Tr in next st. Continue from * to last st (which is a ch 3 from previous row). Dc in last st instead of tr. Turn. 3. Ch 2. *Tr in next st. 1 fpdc around next st. Continue from * to last st (which is ch 3 from previous row). 1 Dc in last st instead of fpdc. Turn. 4. Repeat rows 2 and 3 until you have worked through all 4 skiens of yarn. Fasten off, leaving a long tail. 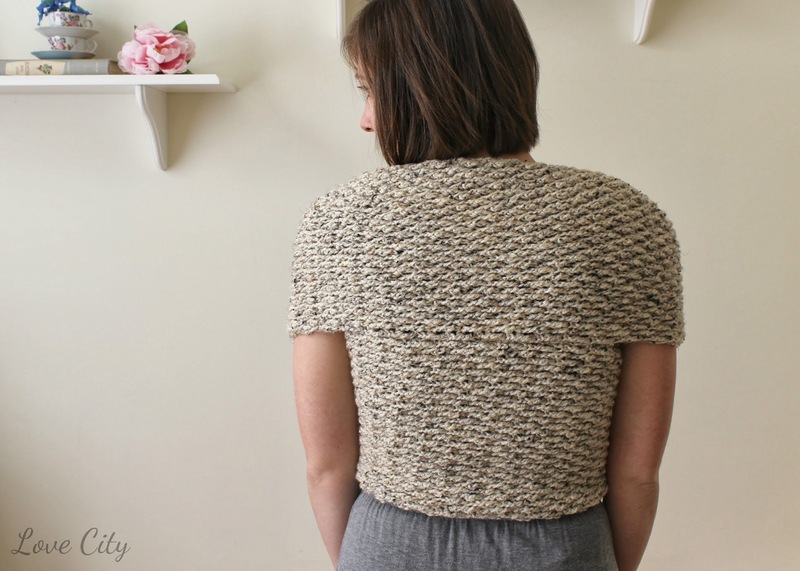 Before sewing short ends together, place wrap across your back at the shoulders. Bring the ends to the front and cross them over your chest. Wrap each end down and around your back. Where the short ends meet behind your back, is where they need to be sewn together. Have someone help you if needed. That's it! The trickiest part is putting it together the right way. 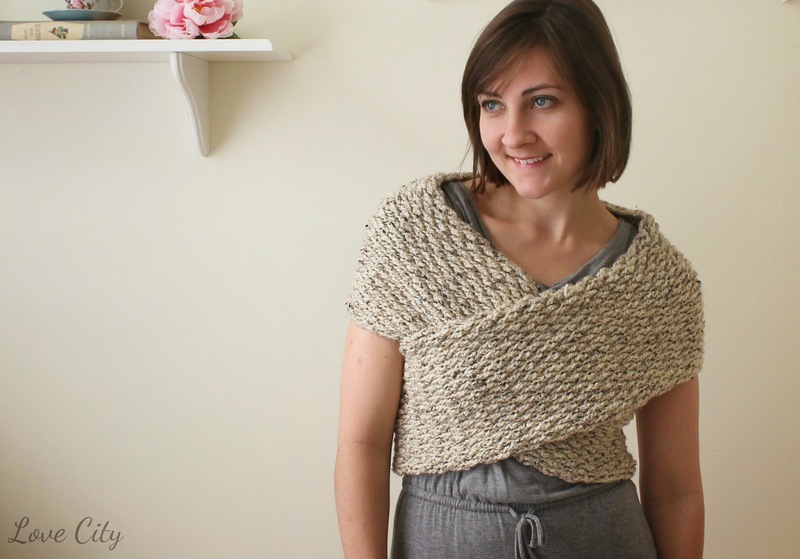 This wrap is also great because you can use it in a few different ways! Besides a wrap, you can also wear it as a cowl, or even pull it up over your head like a hood (or snood...but I don't like that word). I hope you enjoy! I'm off to go stare at the snow and at my pile of yarn to figure out what I want to make next! Love the texture of that stitch pattern. It looks great! I'm head over heals in love with this design! And I MUST make one of these. Hope you won't mind me linking to the pattern tomorrow at Tangled Happy. Thank you for sharing! I can't wait to try this! Thank you!! I love this wrap! It looks cute and also looks like it would work up easily. I can't wait to try this and make one for me, my sisters, my nieces... Thanks! I wish I knew what "Tr" meant in your pattern description, would that be treble crochet? I would like to know how wide this is. About how long was your piece before joining and sewing together? Woul like to know as a reference when using other yarns. How long was your piece before joining? Please also remember that there will be plenty of stretch, both ways! Love your wrap and I shared it with my group on Ravelry. One question a few people had was if it was hard to put on? It's a great looking wrap and I'd love to crochet it for my DIL. Are we allowed to sell finished products from this design? As long as we link to the pattern for people that crochet? I think this design is SO adorable and I would love to be able to share it even with people that don't crochet :) Thanks bunches! Thank you for sharing your pattern. It is a wrap I have been trying to figure out how to crochet since seeing the knitted version. I finished one a few weeks ago. You can see it on my G+ account. Is this written in British English, or American English? I love this! Is there any way this pattern can be transferred to knit instesd of crochet? I don't understand the OPTIONAL section. Everything blends in the picture, so its hard to tell. Once you sew both short ends together l, what else is there to sew that's considered the top and bottom of the back? I haven't crochet in a while, I'm not sure what Bpdc stand for. This is a great looking piece! I'm giving it a try and confused about Step 3. There is not a "ch 3 from previous row" - there is however a ch 2. Please clarify, thanks!! To clarify (as it looks confusing to me!) - insert your hook from back to front thru the space to the right of the post, go around the post, then from front to back thru the space to the left of the post. Then yo, pull the hook thru both spaces, yo, pull thru 2, yo pull thru 2. Lyndsay, having trouble with pattern laying flat and even...any suggestions? an ornamental hairnet or fabric bag worn over the hair at the back of a woman's head. a wide ring of knitted material worn as a hood or scarf. a short line attaching a hook to a main line in sea fishing. Old English snōd, of unknown origin. I love this pattern!! There was a similar wrap sweater on the show "Outlander" this past week! !